A fantastic artwork and supply source guide for those of you looking for artwork for gunstocks, receivers, knife blades and handles, motorcycles, cars or trucks. This custom engraving package is what so many of you have been asking for! 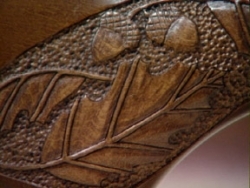 The patterns range from wildlife designs to patterns ready for gunstocks, scroll patterns for knives and receivers and over 12 different alphabet fonts ranging from block to script. There is also a large variety of patterns resembling tattoo designs including: skulls, cobras, dragons, exotic women to roses. This artwork package has over 400 designs and patterns ready to use with SCM's stencil paper and the high speed engraver.